Take a guided history tour of Rose Hall Great House. Built in 1770, the Rose Hall Great House was the home of the Palmer family from England, who started the enormous sugar plantation. In 1820, John Palmer married a gorgeous brunette named Annie. Annie was a petite woman about 4′ 11″ tall, who moved to the beautiful island of Jamaica and became known as the infamous White Witch of Rose Hall. Once settled in, Annie murdered all three of her husbands along with a number of her slave lovers. But her black magic didn’t protect her from meeting her own death in 1831, when she was murdered by her slaves, who then set the Great House on fire. The Great House named for its 365 windows, 52 doors and 12 bedrooms, presides on 6,600-acre of the Rose Hall estates, just outside Montego Bay. The two story colonial house is complete with antique furniture, bulletwood beams, and a coral stone dungeon where the Annie would torture her slaves. Climb the creaking mahogany stairs to the upper level to see the bedrooms where all the loving and killing took place. Legend says that Annie, still haunts the Rose Hall Great House. Their are those even today who claim to have seen her passing through the upstairs rooms of the House. 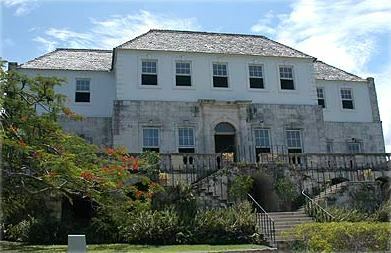 Rose hall Great House was later restored to its original 18th Century grandeur – now a national monument in Jamaica. Duration: 2 hrs. 30 min.